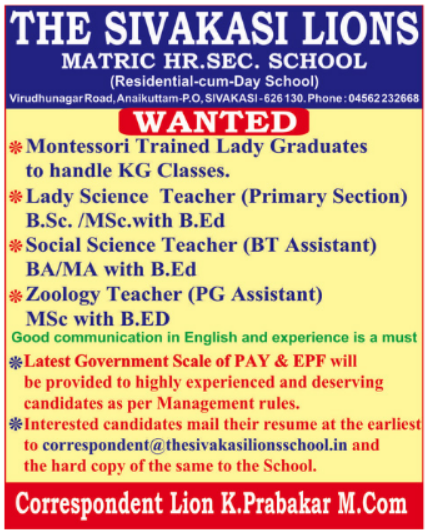 The Sivakasi Lions Matric Hr Sec School, Sivakasi has advertised in the DINAMALAR newspaper for the recruitment of Teachers jobs vacancies. Interested and eligible job aspirants are requested to apply immediately from 30th September 2018. Check out further more details below. About School: The School was established by the Lions Club of Sivakasi as the Lions Kindergarten School at Palaniandavarpuram Colony, Sivakasi on 26th August 1968. Bharat Ratna K.Kamaraj, the creator of educational consciousness in Tamilnadu laid the foundation stone for the school building, constructed with generous donations from the members of the Lions Club of Sivakasi and other philanthropists of Sivakasi on 6th April 1970. The school has steadily grown into The Sivakasi Lions Matriculation Higher Secondary School and has been providing excellent education in English to the children of this part of the country.